In addition to the mRNA template, many other molecules contribute to the process of translation. The composition of each component may vary across species; for instance, ribosomes may consist of different numbers of ribosomal RNAs (rRNA) and polypeptides depending on the organism. However, the general structures and functions of the protein synthesis machinery are comparable from bacteria to human cells. Translation requires the input of an mRNA template, ribosomes, tRNAs, and various enzymatic factors (Figure 9.19). Given the different numbers of “letters” in the mRNA and protein “alphabets,” combinations of nucleotides corresponded to single amino acids. Using a three-nucleotide code means that there are a total of 64 (4 × 4 × 4) possible combinations; therefore, a given amino acid is encoded by more than one nucleotide triplet (Figure 9.20). In prokaryotes and eukaryotes, the basics of polypeptide elongation are the same, so we will review elongation from the perspective of E. coli. The large ribosomal subunit of E. coli consists of three compartments: the A site binds incoming charged tRNAs (tRNAs with their attached specific amino acids). The P site binds charged tRNAs carrying amino acids that have formed bonds with the growing polypeptide chain but have not yet dissociated from their corresponding tRNA. The E site releases dissociated tRNAs so they can be recharged with free amino acids. 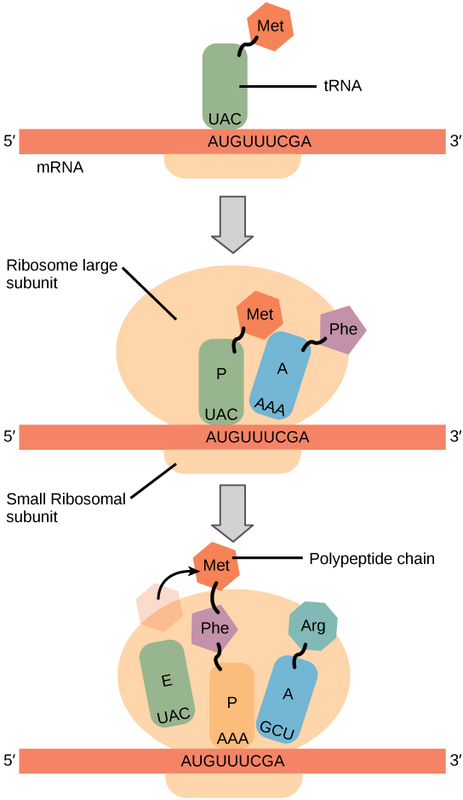 The ribosome shifts one codon at a time, catalyzing each process that occurs in the three sites. With each step, a charged tRNA enters the complex, the polypeptide becomes one amino acid longer, and an uncharged tRNA departs. The energy for each bond between amino acids is derived from GTP, a molecule similar to ATP (Figure 9.21). Amazingly, the E. coli translation apparatus takes only 0.05 seconds to add each amino acid, meaning that a 200-amino acid polypeptide could be translated in just 10 seconds. Figure 9.21 Translation begins when a tRNA anticodon recognizes a codon on the mRNA. The large ribosomal subunit joins the small subunit, and a second tRNA is recruited. As the mRNA moves relative to the ribosome, the polypeptide chain is formed. Entry of a release factor into the A site terminates translation and the components dissociate. 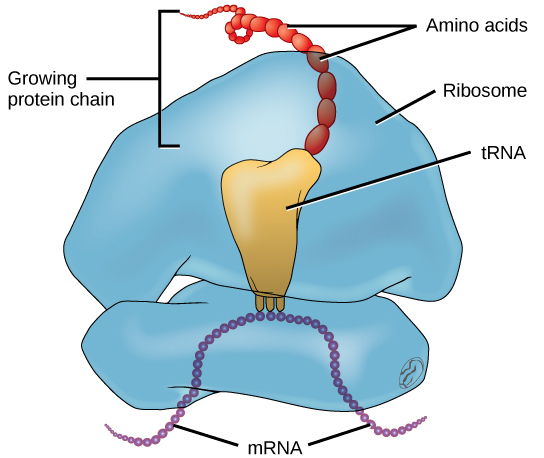 The RNA components of ribosomes are synthesized in the ________. How long would the peptide be that is translated from this MRNA sequence: 5′-AUGGGCUACCGA-3′? The mRNA would be: 5′-AUGGCCGGUUAUUAAGCA-3′. The protein would be: MAGY. 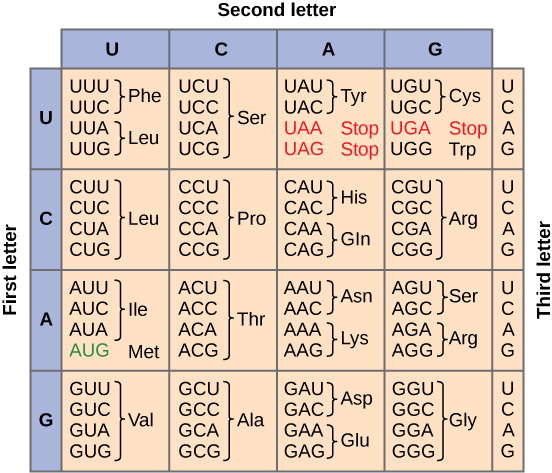 Even though there are six codons, the fifth codon corresponds to a stop, so the sixth codon would not be translated. 9.4 Translation by Charles Molnar and Jane Gair is licensed under a Creative Commons Attribution 4.0 International License, except where otherwise noted.